02:09 ANAND How does MinetestBot not ping me when posting git updates? 06:02 AceNovo Anyone have 5.0 running on MacOS or Android already? 06:05 Emerald2 Android version is in beta. 06:28 Emerald2 I got no idea about MacOS. 13:22 Pen Noob question: is it possible to use Java Minecraft mods on MineTest? 16:02 Telesight Hello all ..
16:03 Telesight Normally I do: git pull -f; make -j$(nproc) But how to point to 5.0? 16:05 Telesight So I have nothing to change in a config? 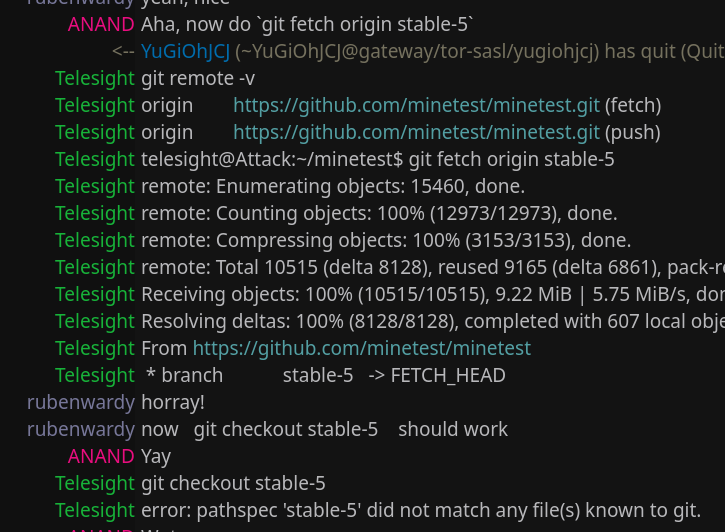 16:14 Telesight error: pathspec 'origin/stable-5' did not match any file(s) known to git. 16:16 Telesight error: pathspec 'stable-5' did not match any file(s) known to git. 16:16 rubenwardy what is git remote get-url origin ? 16:21 Krock both are valid..
16:29 rubenwardy did you clone from the official repo? 16:30 Telesight error: pathspec 'stable-5' did not match any file(s) known to git. 16:31 rubenwardy what OS are you on? 16:32 ANAND Did git get corrupted or smth? 16:33 rubenwardy what does git branch say? 16:38 ANAND Did you try `git remote -v` yet? 16:40 Telesight remote: Enumerating objects: 15460, done. 16:40 Telesight remote: Counting objects: 100% (12973/12973), done. 16:40 Telesight remote: Compressing objects: 100% (3153/3153), done. 16:40 Telesight Receiving objects: 100% (10515/10515), 9.22 MiB | 5.75 MiB/s, done. 16:40 Telesight Resolving deltas: 100% (8128/8128), completed with 607 local objects. 16:42 Telesight error: pathspec 'stable-5' did not match any file(s) known to git. 16:46 Telesight Do I have to change soemthing in .git/config ? 16:54 Telesight fatal: Cannot update paths and switch to branch 'stable-5' at the same time. 16:54 Telesight Did you intend to checkout 'origin/stable-5' which can not be resolved as commit? 16:56 Telesight fatal: Not a valid object name: 'origin/stable-5'. 17:01 Telesight error: pathspec 'stable-0.5' did not match any file(s) known to git. 17:02 Telesight Note: checking out 'origin/stable-0.5'. 17:02 Telesight state without impacting any branches by performing another checkout. 17:06 ANAND Oh right, it's stable-5, right? 17:08 rubenwardy haven't they already done that? 17:09 Telesight error: pathspec 'stable-5' did not match any file(s) known to git. 17:10 Telesight remote: Enumerating objects: 677, done. 17:10 Telesight remote: Counting objects: 100% (556/556), done. 17:10 Telesight remote: Compressing objects: 100% (75/75), done. 17:10 Telesight Receiving objects: 100% (180/180), 23.67 KiB | 0 bytes/s, done. 17:10 Telesight Resolving deltas: 100% (144/144), completed with 51 local objects. 17:12 ShadowBot rubenwardy: Karma for "rubenwardy" has been increased 3 times and decreased 0 times for a total karma of 3. 17:12 ShadowBot rubenwardy: Karma for "Krock" has been increased 3 times and decreased 0 times for a total karma of 3. 17:13 ANAND ShadowBot keeps track of everyone's Karma? 17:13 ShadowBot rubenwardy: Highest karma: "c" (6), "rubenwardy" (3), and "Krock" (3). Lowest karma: "-" (-6), "<JadenWolf> --." (-6), and "[Brackston] -" (-3). You (rubenwardy) are ranked 2 out of 355. 17:14 ANAND How does it increase/decrease? 17:15 ShadowBot rubenwardy: ANAND has neutral karma. 17:15 ShadowBot rubenwardy: Karma for "ANAND" has been increased 1 time and decreased 0 times for a total karma of 1. 17:16 ShadowBot p_gimeno: Karma for "name" has been increased 1 time and decreased 0 times for a total karma of 1. 17:16 ShadowBot p_gimeno: Karma for "C" has been increased 7 times and decreased 1 time for a total karma of 6. 17:16 p_gimeno git config remote.origin.fetch "+refs/heads/*:refs/remotes/origin/*"
17:20 Telesight Branch stable-5 set up to track remote branch stable-5 from origin. 17:21 Telesight make -j$(nproc) ? 17:26 Telesight I have to do this too I assume: cd games/minetest_game; git pull -f ? 17:44 rubenwardy also, does 15.04 support C++11?